The Kehilla has maintained a section in a cemetery in Clifton, N.J. almost since its inception. Jews who arrived in the United States during and after the war were encouraged to join burial societies to ensure themselves a plot for their hereafter. But those that belonged to an organized community such as our Kehilla were already covered. This week I visited the cemetery for my mother’s yahrzeit and I wished to visit the grave of a beloved former neighbor after that of my mother. I only knew the approximate location of the grave and I mis-approximated this time- resulting in a twenty-minute stroll between the graves. Up and down the rows and aisles I trudged on a windy and chilly day. This turned out to be an experience worthy of a short essay. Firstly, because we are a small and close knit community, walking between the graves means seeing many familiar names. And if you know a little bit about the lives of the people there, then you have actually reviewed 75 years of history at once. Tanta Nettie Dessau- Was born Jeanette Golde, the son of the Shul’s secretary in Frankfurt. She attended the Realschule and received teacher certification at the state school in Frankfurt. She was deported to Bergen Belsen with her husband and he perished there. She was a devoted mother to her daughter (as her stone relates) and the beloved “tante” to close to 50 years of kindergarteners in our school. Jerry G B is buried immediately next to his father-in-law Rav Bruer. In fact their matzevas seem almost to be touching! This tells a story in itself. The fact that the Bechhofer’s gave over their private lives to be the home of the Rav for so many years of his extended long life. This is all but forgotten now, until you see the two matzevahs standing as a team. Eli Wechsler- His matzeva is in the front row as well. I do not know why this came to be. There are several Kohanim in the front row so as to make it accessable for their Koein relatives to visit and remain in the car or at a distance. 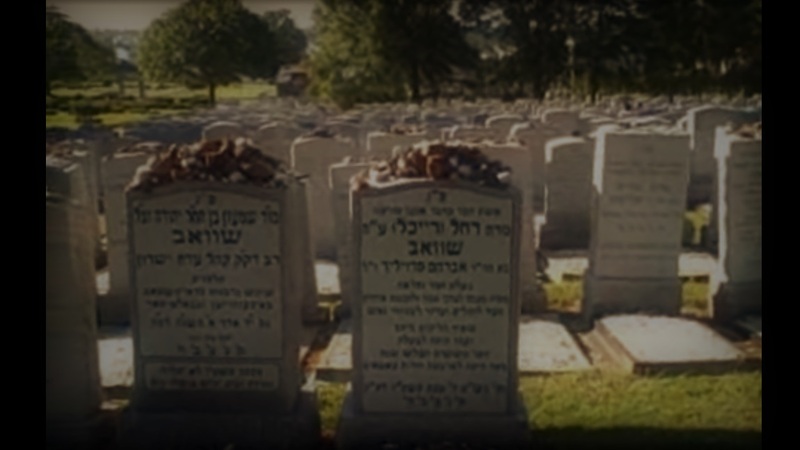 (This practice is obsolete today as many trees have grown over the road in the cemetery creating an “Ohel”, a problem even for a Kohein in a car.) I assume that his placement up front is not merely because of his service to the community, but because of the tragic way in which he left this world. At the time NYC was crime-ridden and people were uneasy about the muggings and “push-in” burglaries common in New York. Then one day Eli was returning home from Boro PArk (we had just seen him in front of G&Sons and waved to him!) and a common criminal followed him into the lobby of his building and shot him when he tried to escape the mugging. The entire communty was traumatized by this as he left behind a young wife and family. His placement up front with the rabonim brings to mind the solemn respect and awe that the community still feels for the young “Korban”. Several members of the Bamberger family are buried here. Almost all of their matzevahs make mention of their descent from the famed Wurzburger Rav. Tucked between the matzevas is a small sized stone for a six year old boy. Meir aH, the son of the scientist-talmid chochom Dr. Leo Levy of Bayit Vegan, drowned in the lake at Tannersvile many decades ago. The stone describes how he brought so much happiness to his parents in such a short time. Enough said. Another young soul whose name was always held in solemn reverence in the community the young and newly married Kenny Herman aH, was diagnosed with Leukimia to the shock of the whole community. We all went down to 90 Bennett to be tested as a match (I seem to remember) and alas he passed away all too young. He was also the son-in-law of our Rav Glucksman and this doubled the pain of the community. For many years (after?) his father Lou aH oversaw the arrangements of burial on behalf of the Shul. Today the father and son lie, reunited, with their headstones next to each other, marking the closure of the painful incident for the father. The stone of the Baochur M. Lehmann, who passed away on shavuos in 1973 after an illness. He was just 21 years old. From what I heard the entire community was plunged into grief that Yom Tov. His parents began a chatiry fund and helped many stuggling families through the years. The charity caries his name and we are used to seeing it in relation to the fund, but here it is etched in a stone. Our Ba’al Koreh Mr. Benno Weiss and his son, who passed away within a week of him. Mr. Weis began leinin for Breuer’s in 1941 and had remained in the rotation for some 50 years. His sone Leo was his closest student, and a prodigy of expert reading. Almost all the Bar Mitzva boys in the Kehila went under his tutelage. Mr. Weis was known to have an encyclopedic mind and remembered with great alacrity every nuance, and many historical (and even pithy details of) events in pre-war Frankfurt. Of course there were many other stones, and each held a story – some of which are too tedious or private to tell (I picked a few public figures). But like the ones above, some of the stones evoke the sentiments related to a particular point in time and the shared recollections of the community.